“He has been raised from the dead, and he is going before you to Galilee; there you will see him” (Matthew 28:7). Yet often as soon as the Easter Vigil is done, we return not to our Galilee but to the day before Ash Wednesday. The extra prayers, the fasting and almsgiving, go out the window as we finish singing “Alleluia! Alleluia!” and walk out the church doors. But Easter is not the signal to return to the way we were before Lent started. Easter is the time for us to begin living renewed lives following the risen Jesus. Do you remember when you first believed in Jesus Christ? Do you remember your own Galilee, where you met the Lord? Our journey during these past 40 days and nights has been getting us ready to return to Galilee. We’re different people than when we began this journey. As we encounter the empty tomb, the question is, will we continue to be different—continue to live with a changed heart? Today, tonight, each of us can ask: What is my Galilee? I need to remind myself, to go back and remember. Where is my Galilee? Do I remember it? Have I forgotten it? Seek, and you will find it! There the Lord is waiting for you. Have I gone off on roads and paths which made me forget it? Lord, help me: tell me what my Galilee is; for you know that I want to return there to encounter you and to let myself be embraced by your mercy. Do not be afraid, do not fear, return to Galilee! The end of Lent is not merely a time to glory in what we have “endured” these past 40 days. The days of Easter that lie ahead of us are the time to continue renewing our faith in the risen Lord. Our encounter with him now encourages us to go forth as the faithful women did that first Easter morn. We are now called to live as disciples of the risen Lord, proclaiming by our words and actions that our merciful God is still in our midst today. Remember your first meeting with the Lord at your own Galilee: remember your encounter with the risen Christ in your own life. Do not be afraid, but go forth into the world to share the joyful news that Our Lord has conquered sin and death. He is alive! 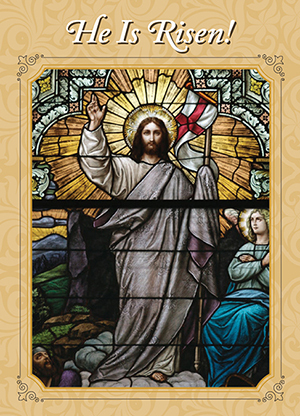 May the risen Redeemer shine on each one of us and our families this glorious Easter day and for the rest of our lives. Provincial Superior Father Paul Borowski, C.Ss.R.